The main problem faced by customers during online shopping is they do not have someone to answer their questions right away. And they want to have someone to address their concerns and help them in real time. 51% of customers think that businesses should not only be available, but also engaged 24/7. This is where live chat support plays an important role. In fact, Acquire.io reported that 79% of consumers who use live chat consider it to be the fastest online channel for getting answers that helped with their purchase decisions. Here are four of the most effective ways to increase conversions and leads using live chat. Live chat can help to establish long-term relationships and have real-time conversations with customers. For your customers, it’s an easy and quick way to find the answers and for you – easy to set up chat tool helping to interact with them. But how will you know what is working for you and what is not? For this, you need to evaluate and monitor your live chat performance. This will help you to further improve and update the process. Use the key chat metrics explained below to monitor your chat performance. 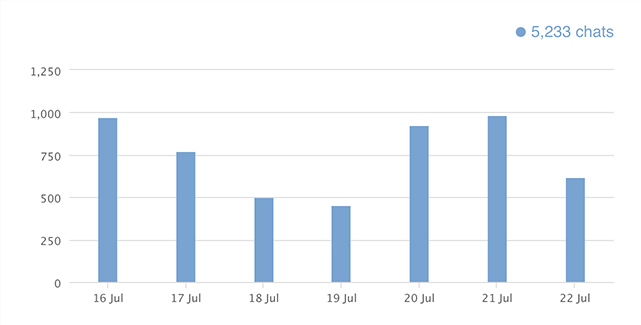 Number of chats – By monitoring the number of chats, you will learn which days to expect a surge in chat volumes. With these insights, you can efficiently handle the peak hours by allocating your agents accordingly. 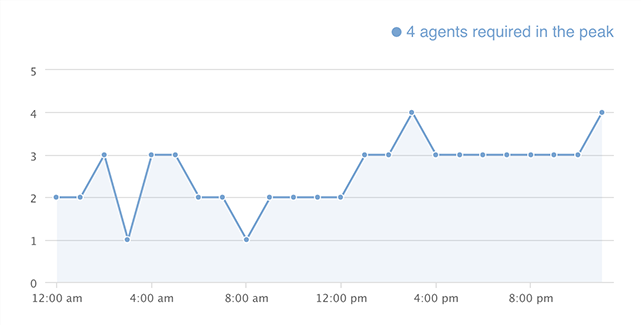 LiveChat even automatically predicts the number of agents that might be required at a certain time. This helps make it easier for you to manage your staff. Chat duration – Chat duration or chat length is the amount of time taken by an agent to resolve customer issues. This is a really important metric to measure the overall effectiveness of your live chat process. Short chat duration implies that the chat was efficient enough to understand the customer’s issue and solve it. Long chat duration, on the other hand, is a sign of an inefficient process and requires improvement. Customer happiness – Customer happiness is the core objective of any business. You can ask customers to rate their chat experience on the scale of 1 to 10, with 1 being the poorest and 10 being an excellent experience. Based on this, you can determine how happy your customers are with their live chat experience. You can also ask the customer to complete a post-chat survey. Ensure the survey forms are clear, concise, and specific enough to provide you with the insights you need. This will help you to understand how customers feel about your live chat service, and discover opportunities for future improvement. Take your monitoring efforts to the next level by integrating LiveChat with all-in-one dashboards like Cyfe. Zapier lets you perform this integration. 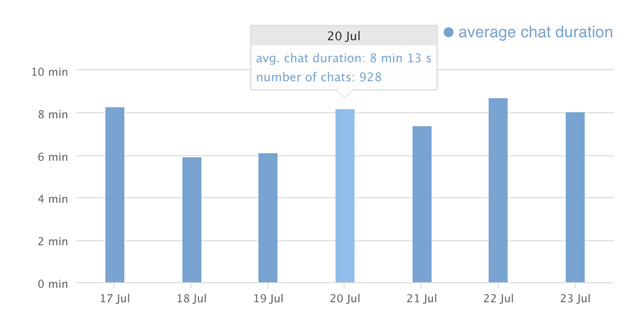 You will be able to monitor all the important chat metrics from this dashboard and even set up a data mashup widget. Using this widget, you can collect and monitor your chat metrics along with data from other relevant sources. This will help you gain a better understanding of how your chat sessions correlate with other activities such as sales conversions, onsite browsing activity, etc. And you will then be able to use this data to improve your process. Have a look at LiveChat Marketplace for more integration options. Even before starting a chat session, customers should be given a pre-chat form to fill in. Gathering customer’s preliminary information helps you to quickly allocate an agent who is qualified to handle the topic. This reduces the waiting time and helps the chat agent to answer the customers as quickly as possible. An excellent example of a simple pre-chat form can be seen on Maids in Black. They use a very simple and basic pre-chat form to collect their customers’ information. 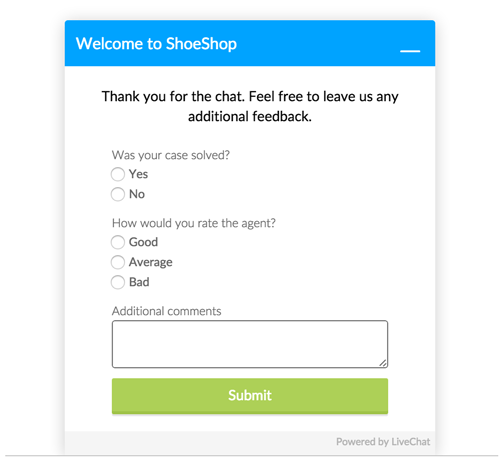 A short form helps the customer quickly connect with a chat agent. It also helps the team to immediately direct the chat to a relevant person or team. By integrating a CRM with live chat, you can collect and store information from all your customers. Thanks to that, the minute a chat agent starts a conversation with a prospect, the CRM tool will automatically capture all of the information available. The CRM tool captures data like name, phone numbers, email address, a copy of the chat transcript, and IP location. This data can be useful in building customer profiles. If a customer starts another live chat session, the agent does not have to ask for their introduction again. The agents can also use the collected data to customize their communication to the customer. This will further help them to categorize their customers into different groups, and send them personalized campaigns. 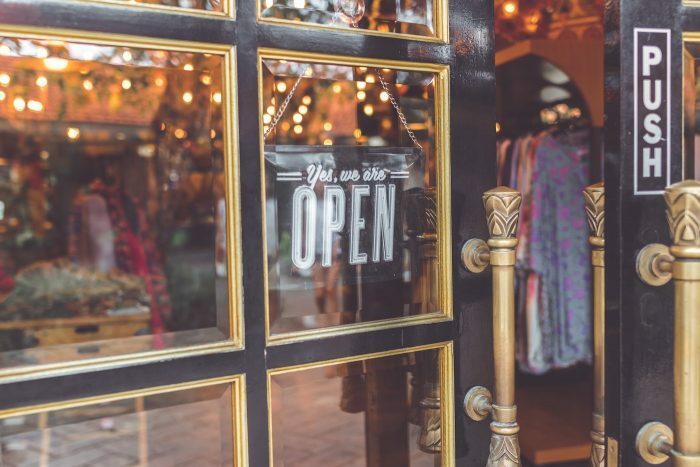 It doesn’t require a lot of effort to leverage live chat in a way that drives more conversions and leads for your business. Start by choosing the right live chat software and understanding the key metrics to measure your performance so you can quickly identify scope for improvement. Get to know the needs and expectations of your visitors better by having them complete a simple pre-chat form. Additionally, keep track of your leads more effectively by integrating your live chat with your CRM. These steps can help you leverage live chat to gain more leads and convert them into paying customers.